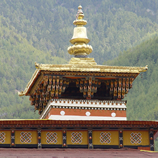 Bhutanese architecture is one of the most remarkable features of the country. The amazing part of Bhutanese architecture is that it does not use either nails or iron bars, The Bhutanese architectural is exhibited in the form of Dzongs(fort-monasteries),remote goembas (monasteries), chortens, Temples (lhakangs),as well as the traditional houses. 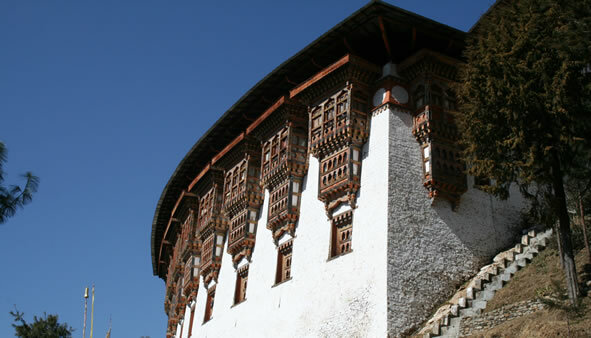 The Dzongs architecture is one of the striking of the kingdom. The Dzongs are built huge with grand design which dominate the major towns and serves as the administrative headquarters all twenty dzongkhags(Disticts).We can see few Dzongs that have been abandoned or destroyed,or now are used for other purpose, namely Simtokha dzong ,south of Thimphu, and Dobji Dzong ,south of Chhuzom.Almost all the Dzongs had Ta dzong(watch tower) which is built separately ,as in Paro and Trongsa Dzongs. 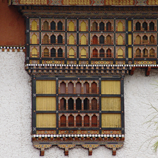 The way of building houses in Bhutan varies depending on the location, particularly the elevation. In the lower altitude we can see houses built of bamboo, where else in the high altitude homes are simple stone structure and even we see yak-hair tents. 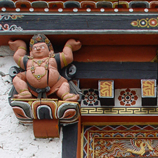 Houses in the inner- Himalayan zone are built in a typically Bhutanese style; many houses are decorated with paints and carved wooden phalluses. Bhutan has a very big number of religious buildings design for different purpose, According to the National Commission for Culture Affairs there are 2002 religious building-1434 are owned by government and an estimated 568 are privately owned.